Collagen Slim capsules pose a serious risk to your health and should not be taken. the undeclared prescription substance sibutramine - despite the product label claim that it is natural and contains no medicines. 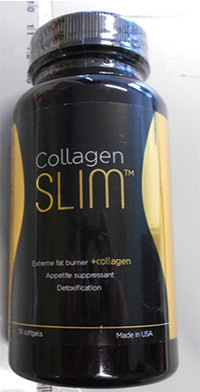 the levels of sibutramine found in the Collagen Slim capsules are above the previously allowable prescription levels. 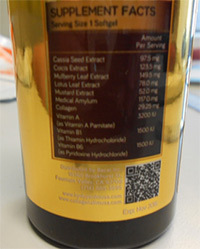 The supply of Collagen Slim capsules is illegal. Collagen Slim capsules have not been assessed by the TGA for quality, safety or efficacy as required under Australian legislation, and the place of manufacture is not approved by the TGA. Stop taking Collagen Slim capsules and take any remaining capsules to your local pharmacy for safe disposal. The TGA is working with Australian Customs and Border Protection Services (Customs) to help stop future shipments of Collagen Slim capsules from entering Australia. If these capsules are found at the border by Customs they will be seized and destroyed.